A UofT professor and his team of graduate and undergraduate students are pondering our place in the universe. Ue-Li Pen, Professor of Astronomy and Astrophysics and interim director of the Canadian Institute for Theoretical Astrophysics, and his team, are developing a new initiative to commercialize radio signal processing technology. “We are pushing the frontier of the ability to localize things more precisely than ever before,” explained Pen. This is an incredible feat considering the Algonquin Radio Observatory, which was owned by the National Research Council of Canada when it opened in 1959, almost became obsolete. The telescope was privatized and eventually sold to Thoth Technology, a Canadian space and defence company that specializes in services for space applications. Thoth routinely works with researchers to find innovative applications of existing technology and to develop novel technologies. One such technology is Pen’s collaborative SOSCIP research project to develop new very long baseline interferometry (VLBI) tools that will implement and optimize multi-telescope correlation and analysis software. VLBI is one of the most accurate techniques for measuring the earth’s orientation in space. It’s even more precise than that of global positioning system (GPS). VLBI uses two or more telescopes (sometimes in various places around earth) to send, receive and record radio signals. The ultimate goal of the project is to develop the very first web-based interface that will enable virtual visual and audio access to a radio telescope and the invaluable information that VLBI can provide to researchers, space agencies and other government departments. This SOSCIP project will develop tools that will give the industry partner, Thoth Technology, the potential to deliver commercial turnkey VLBI to domestic and international customers, a market valued at approximately $10 million per year. And it’s all happening at the Algonquin Radio Observatory located within Canada’s oldest provincial park. The Algonquin Radio Observatory is one of the largest telescopes in Canada with an antenna that is 46-meters long (equivalent to the width of a football field), and it has an illustrious history – it was the first telescope to demonstrate VLBI. Today, the Observatory runs field schools and hosts guests from around the world. It is also home to the official ground station for the Northern Light Mission to Mars. The team, which includes a mix of post-doctoral fellows, graduate and undergraduate students, are also getting the opportunity to zero in on developing unique skills. 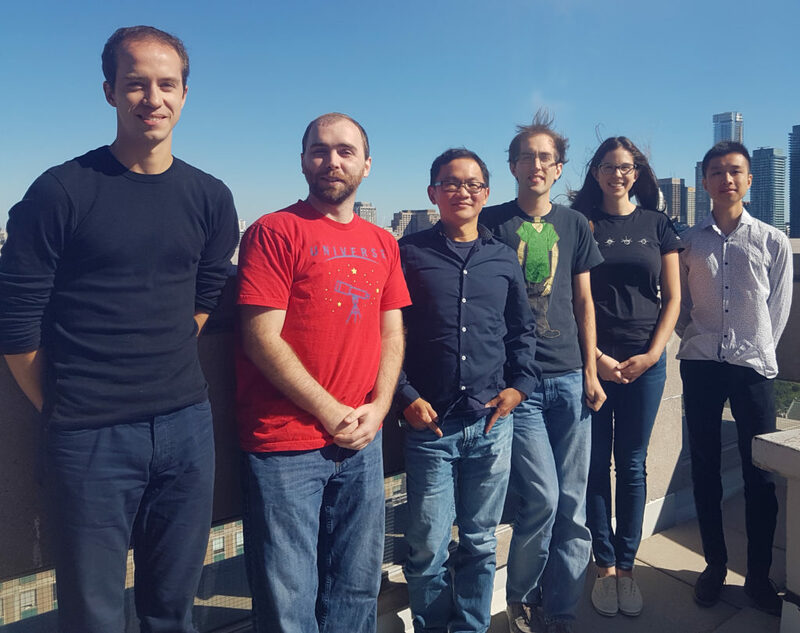 The team (pictured) includes Ryan Mckiven, Robert Main, Ue-Li Pen, Daniel Baker, Dana Simard and Victor Chan, as well as SOSCIP-TalentEdge Fellow John Antoniadis (not pictured). Robert is a PhD student at U of T who is mastering the steep learning curve of the Blue Gene/Q (BGQ). 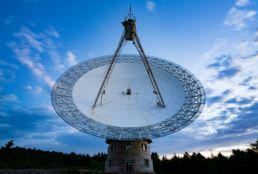 Since VLBI is a big data problem, having access and gaining the skills needed to process massive amounts of data is an experience he won’t soon forget. “The real thing with the BGQ is that we often come back with hard drives full of data – at least 120 terrabytes of all meaningful, true data, and the BGQ is able to make sense of that data in a reasonable time frame.” That’s more data than can fit on 200 average laptops. “What used to take us a thousand days can now be achieved in a day,” agreed Pen. Dana is also a PhD student with the team who’s using the BGQ to make predictions of the scattering of pulsars, a neutron or radio star that rapidly revolves and emits powerful beams (similar to the way a lighthouse beams a light in certain directions). Being able to predict the scattering of these extremely precise objects are useful tools in keeping time and confirming the existence of gravitational radiation. “I’m working on making predictions of what we expect to see with a telescope. If we can use the analytics to predict the scattering we can better study and understand the interstellar medium,” she explains. Robert, Dana, Daniel, Ue-Li and the team recently returned from the Max Planck Institute for Radioastronomy in Bonn, Germany, where they attended the international meeting on scintillometry, the new process pioneered by the Toronto team, including UofT collaborators, Profs. M. van Kerkwijk and K. Vanderlinde. SOSCIP is a research and development consortium that pairs academic and industry researchers with advanced computing tools to fuel Canadian innovation. SOSCIP supports projects that have the potential to have a considerable impact on the lives of Canadians, within areas such as water, cities, health and cybersecurity. The consortium includes 15 of Ontario’s most research-intensive academic institutions as well as Ontario Centres of Excellence and the IBM Canada Research and Development Centre.